The Shoelace Pose is a deep hip opener and requires more mindfulness than most poses! Yet, if done with the breath and with heightened body-mind consciousness, the therapeutic effects are unparalleled! The practice of yoga in the Yin style is relatively "new" in modern terms. However, the long-held, contemplative poses, utilizing the breath and playing with physical edges, is certainly not new. It would appear, that since we are such an active, energetic, striving culture, and more Yang-like, that our culture had to create something to get back to the real origins of the practice of healing yoga. For a complete description of how Yin Yoga differs from Yang, or active yoga, in our current culture, please see my article on "What is Yin Yoga." This will serve as an introduction on how to perform the yoga poses in the Yin style. You may also want to see, "Conscious Breath" to also help you understand how to perform the inner work of the practice. 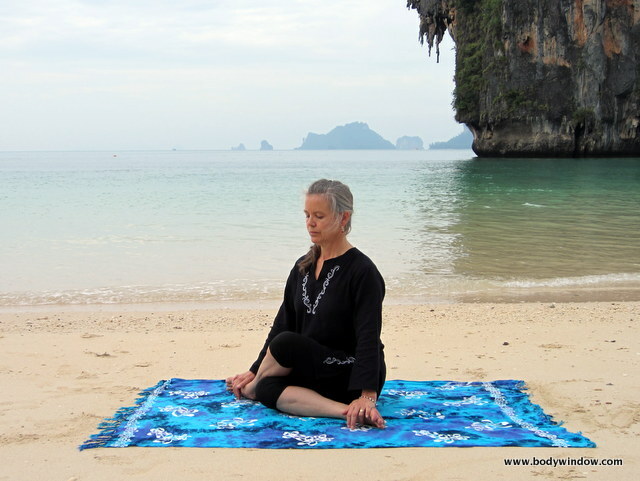 In my opinion, there is no better way to "tune your instruments" than working with the body-mind connection in the practice of Yin Yoga. Your ability to "play life" will be enhanced with the best of health! This pose is very similar to the Square Pose, however, I find the Shoelace Pose even more intense of a hip opener, requiring even more external rotation of the hips. If this pose feels too intense at first, try the Half Shoelace Pose. Begin by placing your right leg underneath you, so as you bend your right leg, your right foot is by your left hip. Next, cross over your left leg, bringing the knees together to stack one on top of the other, as your left foot reaches toward your right hip. See the first picture, below. Now assess your hips. They should not pop up off the ground, but stay connected. Can you hold this position? If your left hip keeps popping off the ground, or the sensation is too intense, straighten out your bottom leg, in front of you, like I show in the Half Shoelace Pose. If your hips stay grounded, and your knees stack easily one on top of the other, you can make the pose more intense, by walking out your ankles, until they are parallel to the front of your mat. I cannot do this as my hips do not have sufficient external rotation. Remember that doing Yin poses is NOT about how far you go, or how good you look, but about your own, internal experience to bring you insight and healing! Next, if your knees, hips and lower back feel safe, and you are breathing deeply and evenly, slowly start to bend forward at the waist. It is not necessary to keep your spine long. Instead, round your back and release into the bending of the pose. If this pose, or any of my suggested modifications remain too intense for your hips, there is always the lovely, Eye of the Needle Pose. It is also an enormously therapeutic hip-opening pose, so please continue to work on those tight hips! Hold this pose for 3-5 minutes, as you notice your inner condition and as you breathe energy into the areas that are tugging. Notice any change in the tension in your hips and back as you send your breath to these areas. When you have held this side for the allotted time, don't forget to also do the yoga pose on the opposite side. Notice if the 2nd side is more open or more closed than the first side, and reflect on what this might mean for you in your life as you breathe into the sensations. Because the hips, sacrum and the belly are highly emotional areas, and where we first gather tension through holding our breath, it is no surprise that lots of stress and therefore emotions, can be released when you hold a deeply hip opening pose. When you are holding the Shoelace Pose, as you breathe into your tight areas, also try to soften your belly and inhale and exhale through it. You may wish to refer to my article on "Belly Breathing" to hone this technique for your practice. It is a very important concept to understand and to use in Yin Yoga. The area that we focus on in this pose is the area of 2nd Chakra energy, or how we relate to ourselves and others in the world. The 2nd Chakra emotional area is frequently in need of deep healing. This pose will help you, as will my Healing Meditation for the 2nd Chakra. Go ahead, and begin your healing today, when you release your hips and emotions in the Shoelace Pose! May your healing of your body, your mind and your soul be complete as you learn to release and let go in this pose!